Exclusive to Shop LC, Table Mountain Shadowkite won't be found anywhere else! Combining an otherworldly blend of blues and greens, it will find a special home in your collection. Table Mountain Shadowkite is a rare material, packed with stunning color! Combining soft baby blue and regal royal blue, these colors are blended with a faint emerald green and deep pine green. With the potential for variety among these four colors, every specimen of shadowkite is ripe with potential. No two appear alike, providing collectors and connoisseurs ample opportunity to collect and treasure this mysterious stone. The color combination of the material is a rare find, even among collectors. The blend found within this stone is unique to the material, and won't be consistently found elsewhere. Our proprietary offering blends together four incredible minerals. The core is comprised of chrysocolla, providing the base. Alongside are found cuprite, malachite and azurite, lending their unique shades and hues. As they blend together, Table Mountain Shadowkite is formed. Notably, the greens and blues of this material derive from the presence of copper. This metal is the primary agent in providing the color for all the gems that make up shadowkite. In addition, copper is also found in other blue gemstones, such as turquoise. In fact, all of these minerals are found alongside seams and deposits of copper. Shop LC first became aware of this material at the Tucson Gem, Mineral and Fossil Showcase. Immediately enchanted by the possibilities offered, arrangements were drawn up with the vendor to collect the finest of the rough material. Once secured, the stone was brought in house to be cut. By using our own facilities for cutting, shaping and polishing, we're able to offer it at incredible prices. Shadowkite launched in 2014 and was an instant hit! Shadowkite is often featured in hand-made sterling silver jewelry made by skilled artisans. Our Bali Legacy and Artisan Crafted collections feature Shadowkite with a variety of opaque and transparent gems that provide additional color and contrast for this multi-colored gem. Turquoise, jade, neon apatite, tanzanite, blue topaz and Mozambique garnet are some of the stones that add contrast to shadowkite jewelry and make it a wonderful gemstone to add to your jewelry collection. • What, exactly, gives shadowkite its unique look - that trademark blend of beautiful colors - vibrant shades of blue and green with accents of deep, dark red? Shadowkite is a composite stone with 4 main components - chrysocolla, malachite, azurite and cuprite. These four distinct materials blend and swirl in infinitely fascinating combinations that make each piece a unique piece of natural beauty. • Chrysocolla is the primary ingredient of shadowkite. Popular for its vibrant green to blue colors, pure specimens are very soft. When used as a lapidary material, chrysocolla is often already blended by nature with another material, such as quartz. In fact, recent studies suggest that chrysocolla may actually be a combination of chalcedony and spertiniite. In antiquity, the mineral was use as flux for soldering gold. 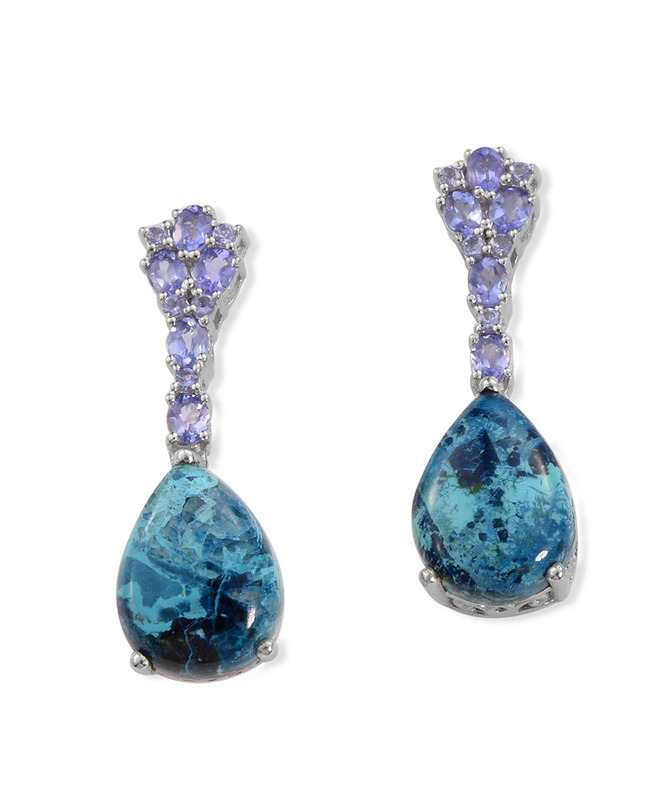 When translated from its Greek roots, chrysocolla literally means "gold glue." • Cuprite is a dark red stone that forms as a result of copper oxidation. Despite its highly attractive gem qualities, alone it is brittle. Therefore, it's rare to find examples of it set in jewelry. • Malachite is known for its distinct green color. With distinctive banding, malachite presents this beloved quality in Table Mountain Shadowkite. Besides gem use, malachite was used in ancient times as a coloring agent and makeup pigment. 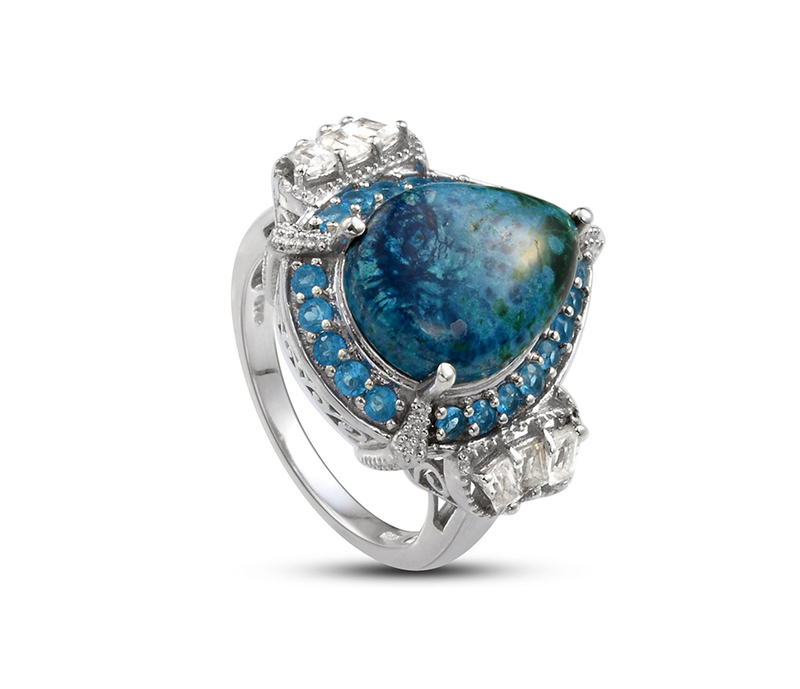 • Azurite is closely related to malachite. Both are prized for their intense colors, and are still finely ground and used by artists today. 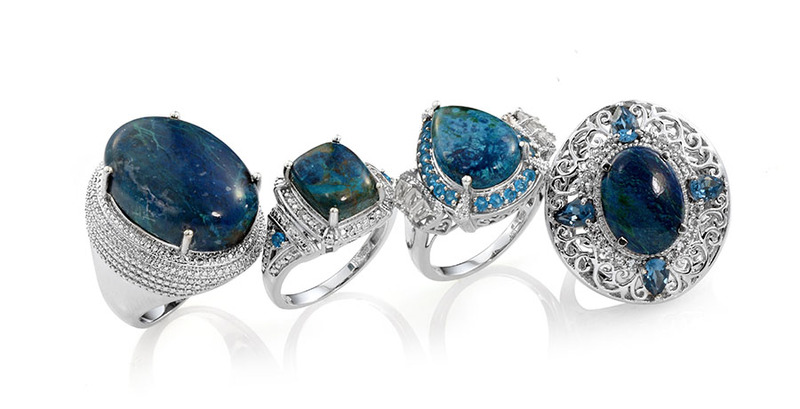 Like its sister stone, azurite was used as a coloring pigment in antiquity. Both azurite and malachite are closely related. They are frequently found together. • No other stone offers the particular blend of colors of shadowkite. Despite this, there are a few stones that might come close. 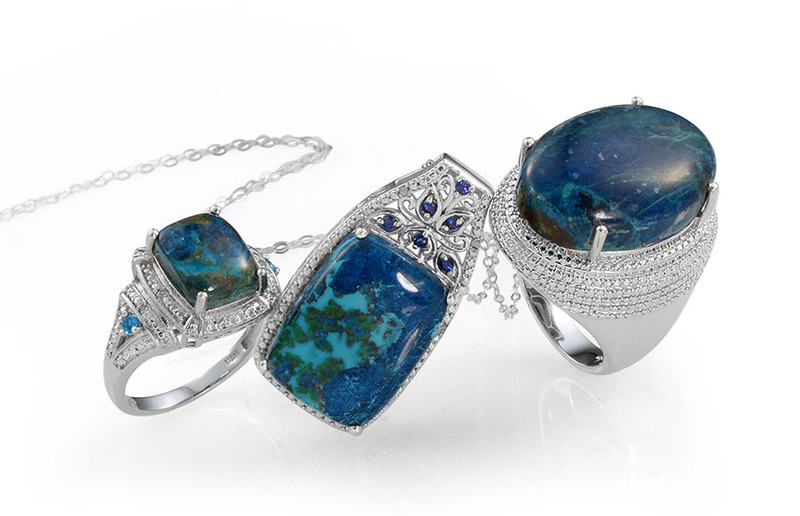 • Eilat stone, from Israel, is mined at the famous King Solomon Mine. Material from this location often appears greener in color when compared to shadowkite. Eilat stone is a popular souvenir for travelers that visit this holy land. • Shattuckite is another such material. It originates from Bisbee, Arizona. Typically, this material presents a deep cyan color. It originates from the Shattuck Mine. Like shadowkite, this material can be found alongside malachite. • Both stones have similar and subtle, but distinct, compositions. They also are all comprised from copper rich minerals, providing their beautiful greens and blues. Table Mountain Shadowkite is named for Table Mountain, an imposing natural feature found within South Africa. The mountain is so named for its flat top. The imposing, majestic profile of the peak towers over nearby Cape Town. 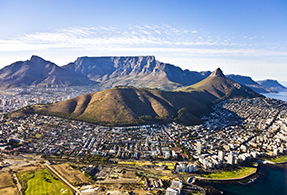 During the 19th century, Table Mountain was an important mine, producing gold, silver, tin and manganese. Today, the mountain is part of the extensive Table Mountain National Park and mining operations are no longer conducted. Table Mountain Shadowkite is mined from location near Cape Town, in the mountain's shadow. Due to the hard rock they must tunnel, progress can be slow. Work is labor intensive, as most mining is done by traditional means. Cool air is circulated into the mineshafts to control heat inside the mine. Despite these challenges, mines in South Africa can frequently go deeper than many other parts of the world. The hard material proves to be stable, and the narrow style of tunnels offers greater structural integrity for far reaching shafts. Ranks 3 to 3.5 on the Mohs scale. Shadowkite is an opaque composite gemstone made of chrysocolla, malachite, azurite and cuprite blend together in unique combinations. Each piece of Shadowkite is a different combination of colors including light powder blue, baby blue, royal blue, light emerald green and pine green, deep red and aubergine. Sourced from around Cape Town, South Africa. Shadowkite can be stabilized with resin material to protect the surface, improve overall durability.